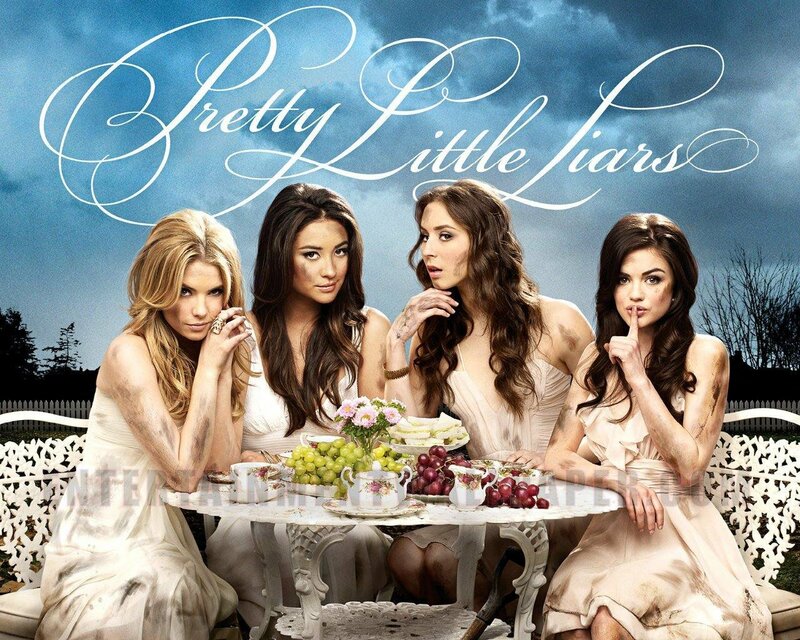 The beauty ideal: Pretty Little Liars - Theories & Hints. Pretty Little Liars - Theories & Hints. Disclaimer: Do NOT read this post if you're still catching up - it'll only ruin it for you. Unless, like me, you like to know what's going on before you watch it. So the Pretty Little Liars season 6 premiere came to UK Netflix this morning and after watching the episode at 8.30am (yes, 8.30am), I've spent the last few hours looking up theories on the internet...and believe me, there are tons! Like pretty much everyone I know who's watched/watching this show, I'm completely obsessed with Hanna, Emily, Spencer and Aria. It's impossible to start this series and not become a bit infatuated. Like seriously, Who TF is -A?! In the March Season 5 finale 'Welcome to the Dollhouse', the Liars have been kidnapped by -A and woken in creepy replicas of their bedrooms in an underground bunker. We find out that Mona is actually alive and being forced by -A to go by Alison (complete with Alison's death outfit and blonde hair). Speaking of Alison, she's still in prison for Mona's murder but has finally clued in Mr and Mrs Hastings to -A's continuous torment. And not forgetting the knights in shining armour - Caleb, Toby and Ezra are combining their knowledge and skills to find the girls. At the end of this episode Spencer realises that the block letters in the toyroom spell out 'Charles' and discovers a home video of Mrs Dilaurentis at Campbell's Apple Farm holding a baby girl (presumed to be Alison) and two young boys that look similar in age and similar in looks. Clearly one is meant to be Jason, but who is the other? Spencer (with -A standing behind her) asks if the other boy is Charles...-A doesn't answer. After this ep, of course everyone jumped to the conclusion that Charles is Jason's twin brother - and for all intents and purposes, I agreed. I believed Charles to be Jason's twin brother. Sasha Pieterse (who plays Alison) stated in an interview that a twin could be making an appearance only it wouldn't be Alison's (for anyone who's read the books, Alison does have an identical twin sister named Courtney). Naturally after the season 5 finale, suspicion fell on Jason since he seems to be the other child in the home video (although no names are mentioned in said video) and especially after Mona's anagrams spelled out 'Charles Dilaurentis'. However after spending my morning reading other theories, I've come to say I'm not entirely sure anymore. Even though I'm convinced the Twin Theory is true, I'm just not so sure about the twin being a boy - and that it's definitely Jason's. Rumours have been floating around that Jessica Dilaurentis is the twin sister of Marion Cavanaugh (Toby's mum) and we all know Marion spent her remaining years in Radley Sanitarium before her untimely death - and who was on the board of trustees? Jessica Dilaurentis. Then there's the unanswered questions about Bethany Young. We know she spent time in Radley and that Jessica Dilaurentis was visiting her but who was she really? was she Jessica's child? A major reason why I believe -A to be a child of Jessica's is because she witnessed whoever hit Alison through the window and Alison awoke to her own mother burying her. What would cause Jessica to bury her child other than to protect another? It's all very fishy. Also Tammin Sursok (who plays Jenna) stated in an interview that someone's revealed to have a twin sister - is -A actually a girl? Which brings up the question of CeCe Drake. There are many stories that CeCe is Jason's twin sister and the story that they dated is just that, a story. A cover-up so nobody would think she was related to him or Alison - I mean it's been stated numerous times on the show how alike Alison and CeCe are, could they be sisters? Remember the story Alison told the Liars on Halloween? about the little girl who stabbed her twin sister? Could this be a parallel to Jason and CeCe and CeCe was sent away because of it? Also, it's been noticed that Alison has a plaque in her room that reads in French but translates to 'It's double the giggles and double the grins, and double the trouble if you're blessed with twins!' We know Alison hasn't got a twin because the show's creators have vehemently denied in several interviews that Courtney will be making an appearance - did it once belong to CeCe? or is it just a nod to the books? There's also the unanswered question of Andrew Campbell. Where is he? We see him hacking a phone call between Veronica and Melissa and now he's MIA. Not to mention the home video was filmed at his family's farm. Does he know more than he's letting on? Is he Charles? Another reveal in the season 6 premiere is the character of Sarah Harvey. Sarah Harvey disappeared around the same time that Alison did - does she have ties to -A and the girls? Emily even spoke to her friends in an earlier season. Charles has kept her all this time, why is she so important? Personally, I'm leaning towards -A definitely being Jason's twin, I'm just not entirely sure who Charles actually is. One thing's for sure, Pretty Little Liars is one big magic show - they're showing you something here to distract you from what's going on over there. It's never straightforward and it's never simple. Either way, I'm dying to find out. Sorry this has so much writing to it, I can't help but just spitball ideas and then I get carried away with myself (take comfort in the fact that this isn't a conversation). I hope there are others who are as interested in the PLL theories I as am.